Do you ever ask yourself what kind of screening tests your newborn will receive? Do you really know what you're getting? And, what does it all mean? Here is a quick run-down of what's included. Vitamin K - In the first hour, following your baby's birth, s/he will receive vitamin K in the thigh via injection; this is to assist with blood clotting. It is assumed that you accept vitamin K for your baby; however, if you choose to do so, you can decline it. Eye drops - Your baby will receive antibiotic eye ointment to prevent any eye infections. Newborn screening testing - In Ontario, newborn screening tests for 29 various diseases (the number varies for each province) to determine possible disorders, such as cystic fibrosis (CF), and others. This screening is taken 24 hours after birth via drops of baby's blood, which is taken by a poke in the baby's heel. I highly recommend breast feeding your baby while s/he is being poked. Note that a positive result means only that there is greater probability that your child has the disease, but not necessarily that s/he has it. If the result is positive, further testing would be required. Your baby's blood type - You will be told what your baby's blood type is, once blood work is done. There are four blood types: A, B, AB and O. In addition, each of the four blood types is classified according to presence of another protein to determine the Rh factor. If you carry this protein, then you are Rh positive; if not, then you are Rh negative. The majority of people (about 85%) are Rh positive. (I'm always the minority:).) Rh incompatibility between mother and child may lead to serious problems in a newborn baby (and potentially the mother); therefore, if your and baby's blood type is incompatible, you may receive the Rhogam shot. And, if you are like my mother-in-law who believes in eating right according to your blood type, it's always good to know your and your baby's blood type:). Bilirubin levels - This blood test, also via a poke in the baby's heel, is taken 24 hours after birth to test for jaundice. 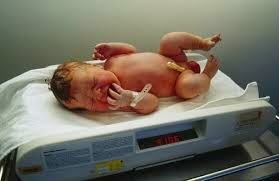 Most babies are born with some jaundice. However, if the bilirubin levels are too high, your baby may be required to stay longer in the hospital and be put under the bili lights. Additional blood work may be required (if bilirubin levels are high and continue to increase) to test for direct/indirect blood cells, and to rule out any potential serious problems with your baby's health. Often, baby will have what is known as 'breast milk jaundice', which goes away on its own. In some extreme cases (like with my first child), you may need to stop breast feeding for 24 hours to help with breaking up the blood cells and reducing the bilirubin count. I highly recommend breast feeding your baby while s/he is being poked. 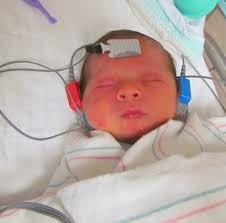 Hearing test - In Ontario, all newborn babies can have their hearing screened. This is usually done in the hospital about 24 hours after birth. It is recommended to do the test after birth to identify any potential hearing problems as soon as possible. 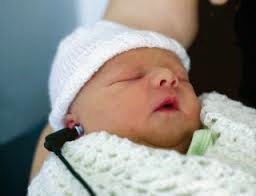 The hearing test is administered by a specialist/professional 24 hours after birth, if done at the hospital. There are two types of newborn hearing screening tests: automated auditory brainstem response (AABR) and otoacoustic emissions (OAE). Each test takes under ten minutes and is painless for the baby. For the OAE test, little devices will be placed in your baby's ear that make soft clicking sounds to measure sound waves. I believe in Ontario, most hospitals use the OAE test only. If your baby has too much mucus in the ear(s) (often happens with 2nd and consequent babies usually due to quick labour - happened with my third), the AABR test will be administered, whereby sensors will be placed on your baby's scalp, as well as small earphones to measure your baby's brainwave activity in response to little clicking sounds. Baby weight - Your baby will be weighed immediately after birth, 24 hours later, and 48-72 later, and then again and again by your midwife or pediatrician to follow your baby's growth. Most newborns lose about one-tenth of their birth weight in the first week and should reach their birth weight again by the second week. After that, your baby's weight will increase quickly. Boys tend to be a little heavier and longer than girls on average and they grow a little faster. I hope this will help ease your mind for the big day. Good luck, and wishing you a quick and easy delivery!